Bike trailers are commonly used to transport children, and they allow you to share your love of bicycling with your little ones. When shopping for the best bike trailers of 2018, you have three major types of products to choose from. The first type of trailer is designed to be directly attached to the seat of your bike, and the second type of trailer is meant to linger just behind the rear wheel. The third type is known as a trailer cycle. A bicycle trailer looks very similar to a sidecar, and in most cases, it can be attached to your bike’s frame or rear axle. Most trailers are made to carry children between the ages of one to six. Some products are designed to carry a single child, and others can hold two. Every bike trailer is rated for a specific amount of weight, and for safety reasons, it’s best to stay far away from the maximum weight. Most trailers are rated for 85 to 120 pounds. When compared with bike seats, trailers are different because they sit much closer to the ground. In terms of visibility, bike seats are better than trailers because they’re easier for drivers to see, and since trailers are less visible, they’re better for recreational trails. You’ll find that most trailers come with a hitch, which increases stability and safety. Some parents like to let their children pedal along with them, and a trailer cycle is a great product for this purpose. Bike trailers make it easy to create long-lasting memories with your children, but if you can’t find the right product, you’ll have a harder time making great memories with your kids. Below, you’ll find reviews for 10 of the best bike trailers on the market, and by reading the reviews and selecting a top product, you can save your precious time and money. If you have plenty of money to spend, consider getting the Weehoo iGo. This trailer has a strong push bar and can carry up to two passengers. It has a total weight capacity of 80 pounds, and for optimal safety, you should never exceed this weight limit. 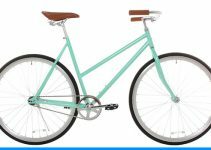 The claimed weight of the product is 40 pounds, and it’s recommended for cycling. The seats are colored a bright red color and help to improve the visibility of the trailer. The iGo trailer helps to maximize fun with your little ones, and it comes with front passenger pedals. To give your passengers a wide view of the world, the trailer features an open cockpit design. The Weehoo iGo trailer is made to eliminate boredom and give your kids an intimate view of nature. It can hold kids between the ages of two to nine, and for additional safety, it’s made with grip handles and buckled straps. Another top product is the Thule Cadence. It uses a patented ezHitch for a secure attachment to your bike, and it’s designed with extra storage space for cargo. When it’s not in use, the trailer can be folded up and stored away. If you love bicycling and want to take your children with you, then this trailer can help you do it. There is enough room in the Thule Cadence child carrier to comfortably seat two young kids. This bicycle trailer is designed to give kids a comfortable, enjoyable ride. You can use it to tow your children around town, and with a climate controlled cockpit, it offers protection against the elements. The extra storage space is great for groceries or extra cargo. This trailer comes with a pull arm, rain cover and side vent, and these features are designed to increase comfort. 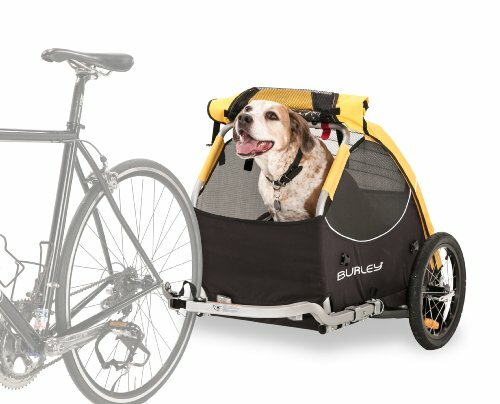 The Burley Tail Wagon is a popular bike trailer. A removable floor makes it easy to clean, and it comes with optional tie downs. For greater stability, this product comes with side battens, and it even has a flip-down tailgate, which is useful for unloading and loading. It has an all-weather cover and waterproof zippers, and a heavy-duty mesh cover covers all four sides of the trailer. The cover delivers maximum airflow and helps to keep young passengers comfortable. This trailer comes with 16-inch quick-release alloy wheels and has a fast-action folding system. It’s even compatible with stroller kits, so you’ll always have the option of enhanced functionality. A comprehensive limited warranty covers all of the fabric and plastic parts. This trailer offers a variety of useful features, and it serves as a reliable way to take your kids on bicycling adventures. 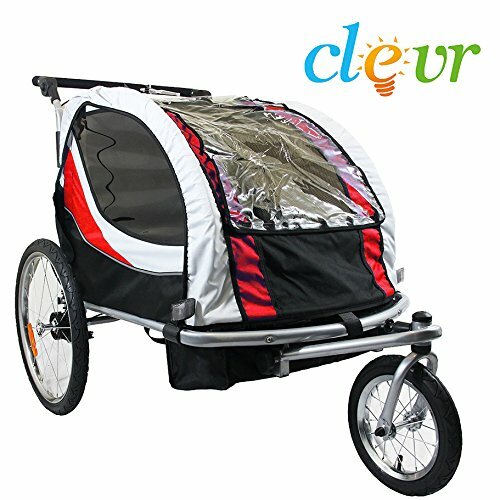 Here we have the Clevr Deluxe 2 bicycle trailer, and it can be used as a jogger or trailer. For easy transportation and storage, the trailer folds flat. It requires minimal time for assembly and comes with a universal bike hitch, which connects the trailer to the rear axle of your bike. The hitch is important because it prevents the trailer from turning upside down. Even if you manage to tip your bicycle over, the Clevr Deluxe 2 will stay upright. For maximum visibility and safety, the trailer is equipped with reflectors on every side. It can hold a maximum of 88 pounds and features a lockable front wheel design. The Clevr Deluxe 2 also has a full suspension system, which significantly improves ride comfort. The canopy is made to resist harsh weather conditions and protect occupants. If you’re looking for a bike trailer that offers a wealth of features, then the Clevr Deluxe 2 bicycle trailer might be a product worth considering. The Burley Honey Bee trailer is designed for transporting kids, and it offers an enjoyable combination of versatility and value. If you prefer to stroll or bike without attachments, this trailer comes with a one-wheel stroller kit. For maximum safety, it has been tested to exceed ASTM F1975-09 safety standards. For easier transportation and storage, this trailer has 20-inch, push-button wheels, and it can be folded into a flat position. The Burley Honey Bee trailer has a maximum weight capacity of 100 pounds, so it’s suitable for one or two small kids. A few of its best features are the seat cargo divider, splash guard, engaged parking brake and latching system. This trailer has been created to give you a great combination of versatility and value, and it never compromises on safety. 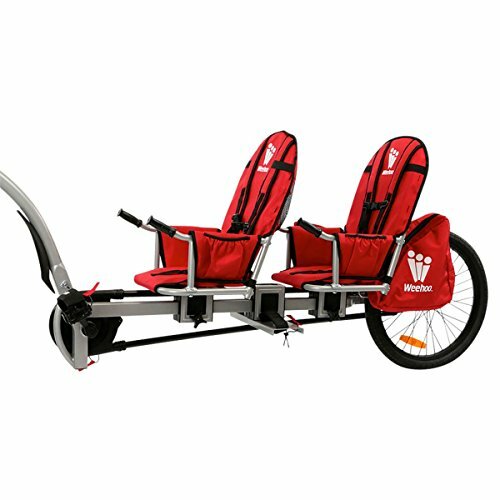 It has enough seating for two kids, and for easier transitions between modes, it has an adjustable handlebar. Once you arrive at your destination, you can activate the parking brake and unload the kids. 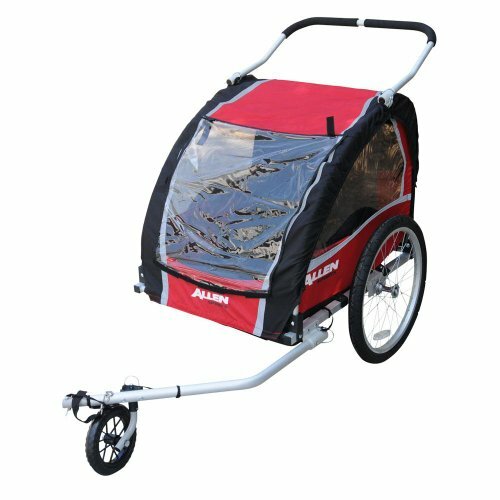 The Allen Sports bicycle trailer is lightweight and capable of carrying two small children. It has a maximum weigh capacity of 100 pounds, and to protect your child’s feet, it has a built-in foot guard. The 16-inch inflated rear wheels offer decent stability, and a safety harness keeps kids strapped into the trailer. Since it has a folding design, this trailer can fit into a small storage space, and it’s easy to transport. If you’re looking for a safe way to take your kids for a ride, the Allen Sports trailer is worth considering. It can be attached to most bikes and doesn’t take much effort to connect and disconnect. With a lightweight steel design, this trailer is strong enough to withstand everyday riding. 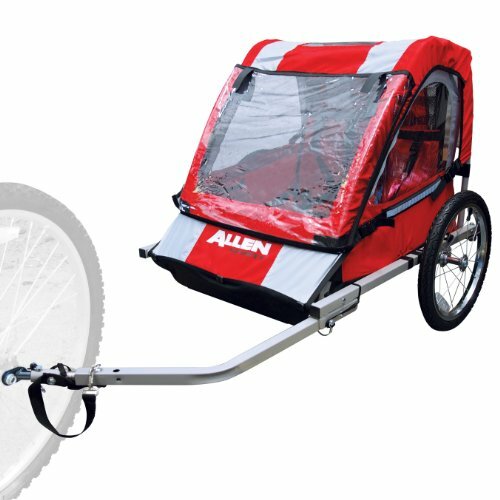 Many other trailers in the same price range have plastic spokes, but the Allen Sports trailer has spokes made from metal. It has enough room to give your kids a comfortable ride, and you might have trouble finding similar features for the same price. The Burley Design Bee bike trailer features a compact design and can be folded for easier transportation and storage. The side and rear windows are tinted, and the rear window is designed for extra ventilation. This trailer has 20-inch push-button wheels, which can be removed quickly. Since it comes with a safety flag, tow arm and hitch, it can be used immediately. The Burley Design Bee bike trailer has a spacious rear cargo area and can be used to carry footballs, basketballs and clothing items. It’s also a great place to keep a diaper bag or groceries. The hammock style seat doesn’t leave your kids sitting on the floor, and it uses a five-point harness system. If you’d like to add some additional accessories, you can use the Velcro on the seat. 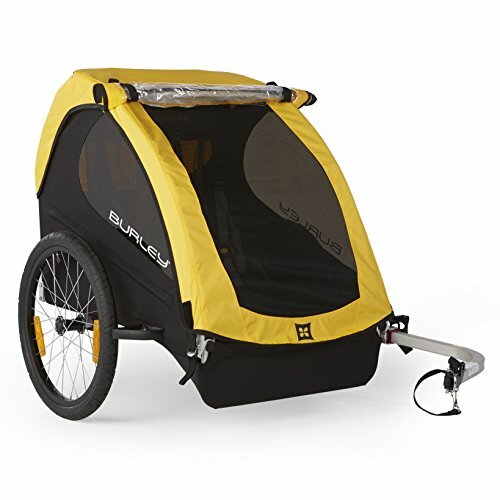 When biking, visibility is a major concern, and the Burley Bee trailer features a bright yellow 600 D polyester cover. It even has reflectors on the back and front of the trailer. 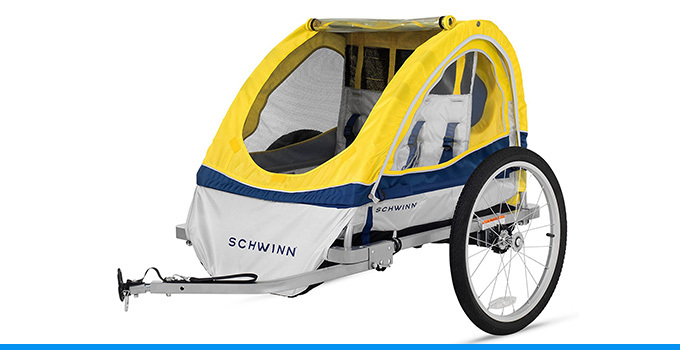 The Schwinn Trailnblazer trailer is one of the cheapest products available. It’s available in two different colors and has a folding frame. A pair of quick-release wheels can be removed and stored away. This trailer has 16-inch pneumatic tires and molded rims, which offer style and performance. 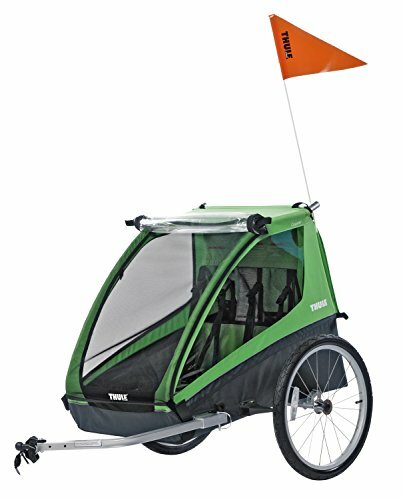 The canopy comes with a weather shield and bug screen, and a versatile coupler makes the trailer compatible with most bicycles. The entire trailer weighs about 32 pounds and has a narrow profile. It’s a great trailer for squeezing through traffic and doesn’t require extensive assembly. 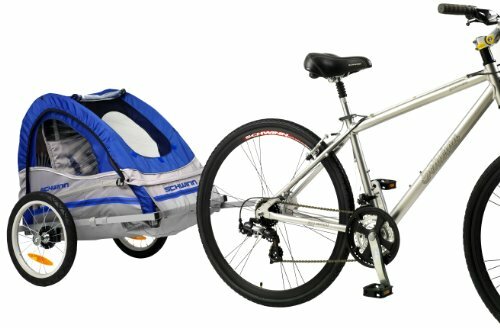 The Schwinn Trailnblazer bike trailer is ideal for transporting a single child and features a taller style. It doesn’t offer nearly as many features as some of the expensive trailers, but you can get it for a very affordable price. 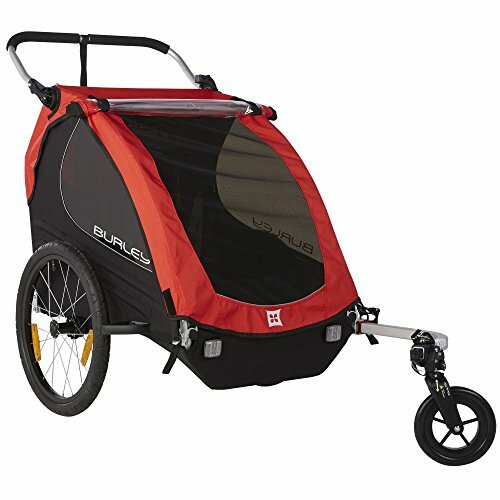 Here we have another bike trailer from Allen Sports, and it’s capable of holding two small children. 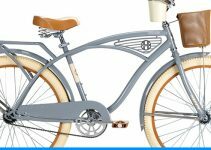 It’s built from a lightweight aluminum frame and uses 20-inch inflated rear wheels. For additional comfort, it has a built-in foot bed. The side and front windows are much larger than what you’d get from other trailers, so your kids will have more scenery to admire. For extra safety, the trailer comes with a flag and safety harness. If the need arises, you can use the adjustable handle to convert this trailer into a stroller. It has a swiveling front wheel and can hold a maximum weight of 100 pounds. Since it comes with a universal coupler, it can be attached to almost any bicycle, and it serves as a great form of transportation for your kids. If you’ve ever went on an adventurous bike ride and wondered what it would feel like to tow your children with you, then this bike trailer might be a product worth considering. 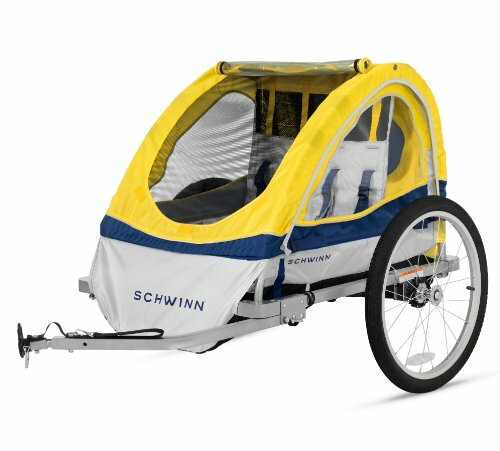 The Schwinn Echo Double bike trailer is available in a bright yellow, which is great for style and visibility. 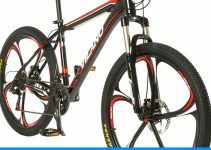 It has 20-inch allow spooked wheels, and a set of air tires deliver style and performance. For enhanced transparency, this trailer has large windows, and the special canopy includes a protective bug screen. To protect your kids against the elements, the Schwinn Echo Double comes with a weather shield. All of these components work together to protect your children from excessive heat, cold and insects. The Schwinn Double Echo comes with a universal trailer coupler, which is compatible with most bicycles. For maximum passenger comfort, the seat comes with shoulder pads and helmet mesh. You don’t have to be the best parent to pick the best bike trailer, and when you select a top product, you can rest assured that your children are safe and comfortable. Bike trailers make it easy to tow your kids and take them with you on your bicycling adventures. With the best trailer, you can spend less time worrying about the safety of your children and direct your attention towards finding the coolest bicycle routes for their enjoyment.